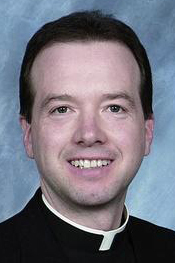 Father Vincent F. Welsh, 50, pastor of SS. Peter and Paul Parish in West Chester, died May 16 at his parent’s East Norriton home. His funeral Mass was celebrated Tuesday, May 20 by Archbishop Charles J. Chaput at SS. Peter and Paul Church. Concelebrants included Father Welsh’s brother Patrick, who was also the homilist, as well as his uncles, Fathers Anthony and Joseph Dieckhaus, and priest classmates from St. Charles Seminary celebrating their 25th anniversary of priesthood on the very date of their ordination in 1989. The third of six children of James J. and Patricia A. (Dieckhaus) Welsh, Father Welsh attended Visitation B.V.M. School in Trooper and Bishop Kenrick High School, where he played the tuba in the school band. Although he has two uncles who are diocesan priests, his parents were taken by complete surprise when he chose the priesthood, according to a 1999 interview with The Catholic Standard and Times. “I didn’t have a clue,” said James Welsh, who had been after his son for not sending away for college applications. “I was folding clothes when he said, ‘If you don’t mind, I’d like to enter St. Charles Seminary,’” his mother recalled. They were equally surprised a few years later when their fifth child, Patrick, also entered St. Charles. Father Welsh was ordained May 20, 1989 by Archbishop Anthony Bevilacqua at the Cathedral Basilica of SS. Peter and Paul, and his first assignment was as parochial vicar at St. Christopher Parish in Northeast Philadelphia, followed by St. Monica in South Philadelphia. After further studies for a licentiate in canon law at the Catholic University of America, he served in the Office of the Metropolitan Tribunal, the Office of the Chancellor and as assistant director of the Office for Clergy. Father Welsh also served as pastor of St. Philip Neri Parish in Philadelphia, St. Francis of Assisi Parish in Norristown, and since 2012, SS. Peter and Paul, West Chester. Although Father Welsh had been very sick from the beginning of the year, the hope in the parish was that he would get better. “He offered up his suffering for the parish,” Fox said. Father Patrick Welsh noted in his homily that his brother received his diagnosis of cancer 10 years ago precisely on May 20 – the date of his ordination and his funeral. He praised his brother’s love for the priesthood and vibrant public witness of the Catholic faith in his life. In addition to his parents and his brother Patrick, Father Welsh is survived by his brothers James, Stephen and Michael and his sister, Mary Chris Little; his priest uncles and other aunts, uncles, cousins, nieces and nephews. Fr Welsh is surely in heaven. While at St Christopher Parish he gave the homily for my dad’s funeral. It was sincere, personal, and inspiring. Thank you Fr Welsh for your love of God and Priesthood. Think of all the lives he touched. God bless him and hold him in your loving arms.